Piramal Realty is the real estate development arm of Piramal Group. In 2015, Piramal Realty secured approximately USD$434 million from international private equity partners, Goldman Sachs and Warburg Pincus. This is one of India’s largest private equity investment in real estate since 2008. Piramal Realty aims to be the gold standard in design, quality, safety and customer centricity in both residential and commercial real estate. Piramal Realty’s developments, while being cutting edge and contemporary, focus on embracing a more intuitive definition of luxury, which celebrates nature, greenery, space, light, ventilation, art, culture and community living. 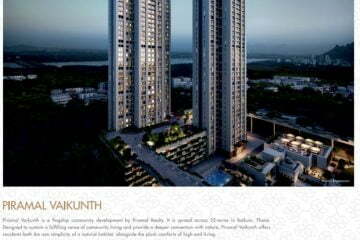 Piramal Vaikunth Piramal Vaikunth houses an exquisite collection of apartments and townhomes in the heart of Thane. Piramal Realty worked with potential customers and scoped out what mattered most to them. Spaciousness, light, ventilation and natural greenery – core principles of biophilic design – took priority. Living in a community of like-minded people was another important aspect of the design philosophy. Piramal Vaikunth has incorporated these elements in all its designs to improve residents’ quality of life. High-ceilinged homes set in large open areas reinforce the principle of spaciousness. Dual aspect apartments with floor-to-ceiling windows provide abundant ventilation, spectacular views and sunlight. All buildings in the estate have been constructed using natural, indigenous, and sustainable materials. Walnut and ceruse oak floors bring warmth to living spaces, and elegant marble and quartz dazzle in the light. Cobbled walking paths, landscaped podiums, and fractal-patterned walls that mimic the intricate designs of seashells and salt flats, are eco-friendly and beautiful to look at. 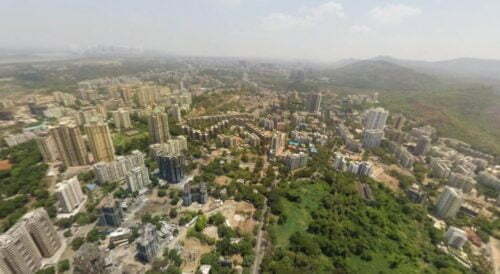 Location & Connectivity Piramal Vaikunth is located in central Thane with connections to Greater Mumbai ensuring the best of both worlds for its residents. They can enjoy the convenience of shopping and dining options, schools, and hospitals while being surrounded by lush hills, lakes, and nature reserves. Vidit at Piramal Vaikunth One of the last towers in Piramal Vaikunth to offer spanning views of the ISKCON Temple, Vidit at Piramal Vaikunth is home to an unmatched collection of apartments. 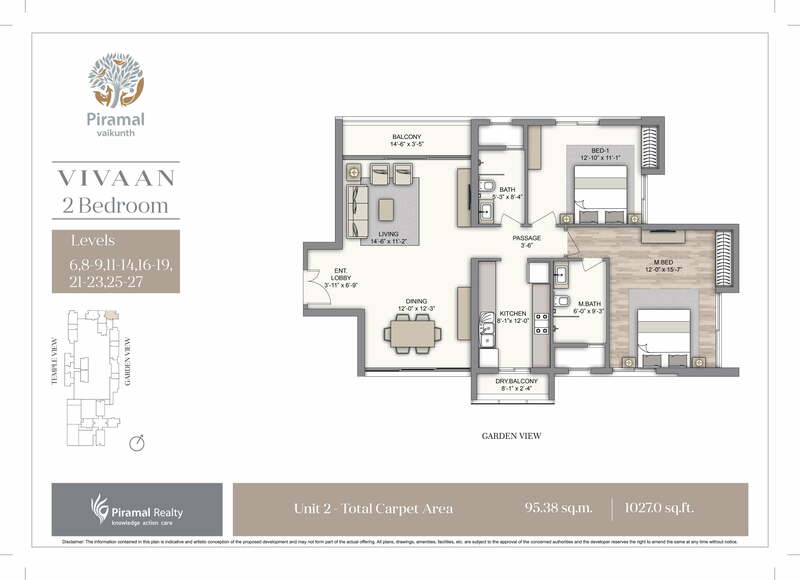 This year, Piramal Realty are marking the launch of Vidit by unveiling the entire tower’s inventory of skillfully-appointed twobedroom apartments. A new take on lifestyle living, apartments in Vidit are air-conditioned, and boast agglomerated marble flooring in the living rooms, kitchens, and bedrooms. World-class bathroom fittings such as Antiskid Vitrified tiles, thoughtfully-designed storage spaces, and state-of-the-art amenities make for a spectacular living experience. Residents of Vidit can take advantage of state-of-the-art facilities such as: Multipurpose badminton and basketball courts; Squash courts; Swimming pool; Mini cricket ground; Gymnasium; Indoor activity room; Café & restaurant; convenience stores, and guest suites and a communal banquet hall. Piramal Assurance Since 2012, Piramal Realty has aimed to enrich lives by setting new standards for customer centricity, architectural design, quality and safety. The core values of Knowledge, Action and Care are an integral part of the company’s philosophy and define Piramal Realty not only at an individual level but also on an organisational level. During these uncertain economic times, Piramal Realty is offering ‘Peace of Mind’ to the home buyers, by launching the first of its kind initiative called Piramal Assurance. BuroHappold has delivered integrated, inspirational design for more than 40 years. With a passion and value-driven philosophy, the company develops innovative, holistic strategies for design and construction that bridge the gap between science and society. DSP Design Associate Design Architect For more than 25 years, DSP has been designing across industries and verticals in India, and around the world. Founded by Yatin Patel, Mehul Shah, and Bimal Desai, DSP creates environments that are fluidly integrated into native ecologies and cultures. HOK Lead Design Architect & Landscape Design HOK International, Ltd. (HOK) is a global full-service design organisation with 55 years of experience. The diversified practice includes comprehensive architectural, engineering, and interior design services, as well as services in a wide range of related disciplines, from facilities consulting to the development of master plans. Lerch Bates provides its services to some of the tallest – and most renowned – buildings in the world. Systra MVA Consulting (India) Private Limited. Traffic Consultants SYSTRA is a world leader in urban and rail transport engineering with projects in 350 cities, spread across 140 countries. Systra MVA Consulting (India) Pvt. 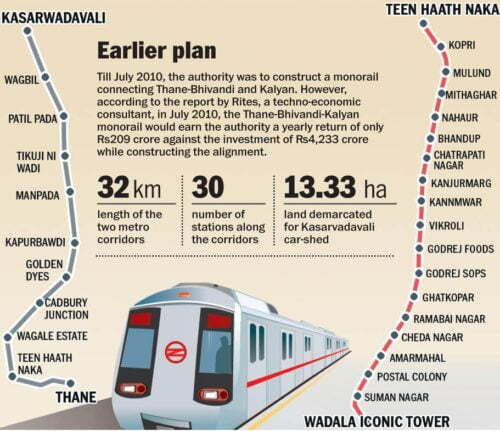 Ltd. has been involved in transportation projects in India for years, and projects have been undertaken on behalf of both public and private sector clients. Studies have covered all aspects of transport planning and traffic engineering. Turner Project Management (India) Private Limited. Project Management Consultants Turner is a North America-based, leading international construction services company. In India, Turner provides world-class project management consultancy services offering clients the accessibility and support of a local firm with the stability and resources of a multinational organisation. Turner’s most iconic projects include Burj Khalifa, Dubai and the Statue of Unity, India. 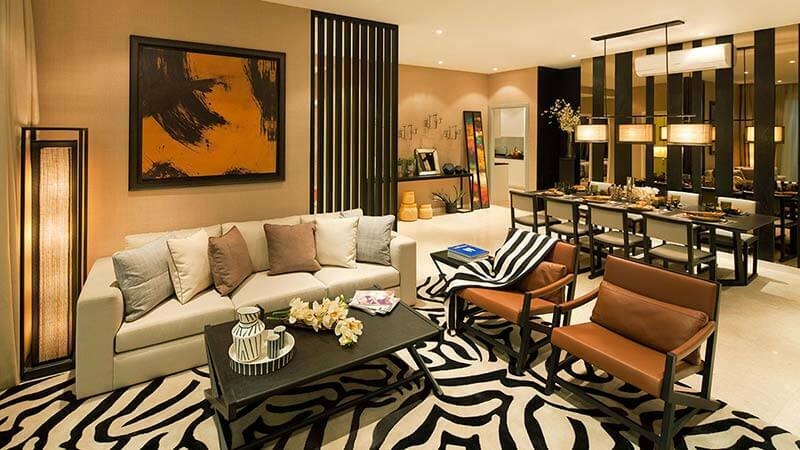 Announcing cash back of INR 1.5 Lakhs on Thane’s largest 2 Bed Luxury Homes. Piramal Vaikunth have an exquisite collection of town homes and apartments in the heart of Thane. It is surrounded by natural reserves and lakes and surrounded by hills. It helps residents to connect with the environment through its unique avenues and at the same time enjoy the comforts of city life. Piramal Vaikunth provides a blend of luxury living with nature’s tranquility which is away from the urban grind. It provides a vibrant community life which relishes the restorative power of the environment Not only that Piramal Vaikunth also preserve indigenous plant species across 32-acre footprint. 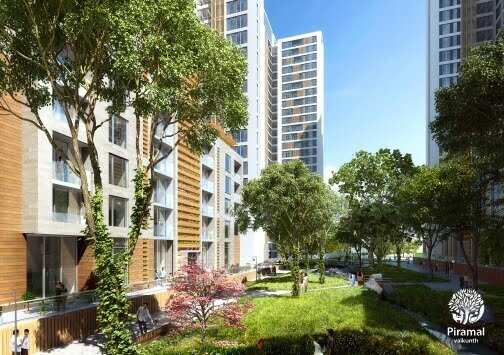 Organic gardens, nature trails and parks with dense foliage will be a part of this project. It will ensure the benefits of natural light and the dual aspect homes along with ventilation will provide a space full of luxury. 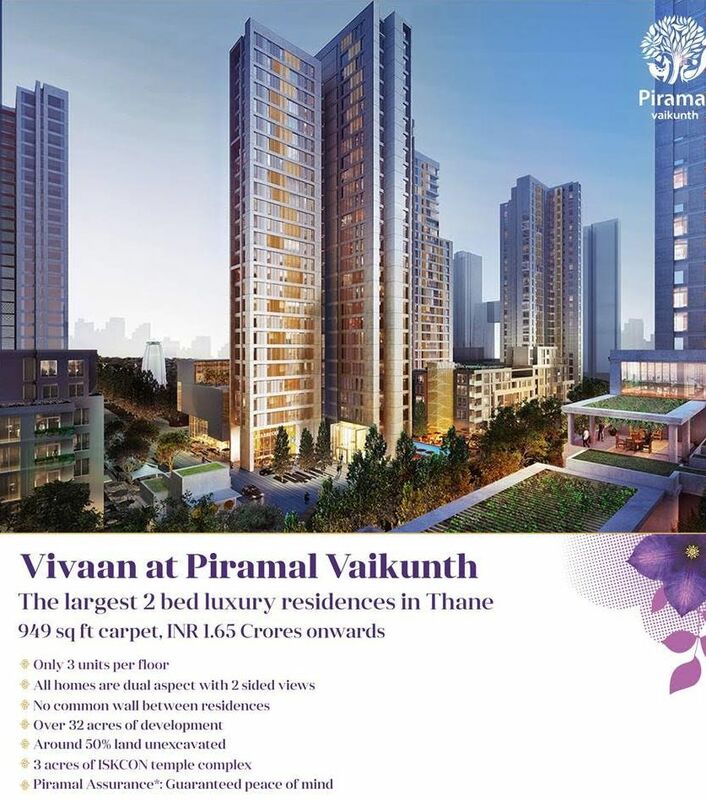 If you are a working person in Mumbai then Piramal Vaikunth ideal location in Central Thane will provide your work life balance because it has excellent connections to Greater Mumbai. If you are Shopaholic and also have a great taste bud then you will find a range of dining and shopping options in this area. 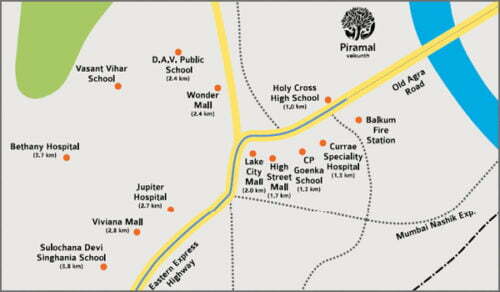 Not only that, also hospitals and schools are in close vicinity and thus the property is surrounded by convenience. 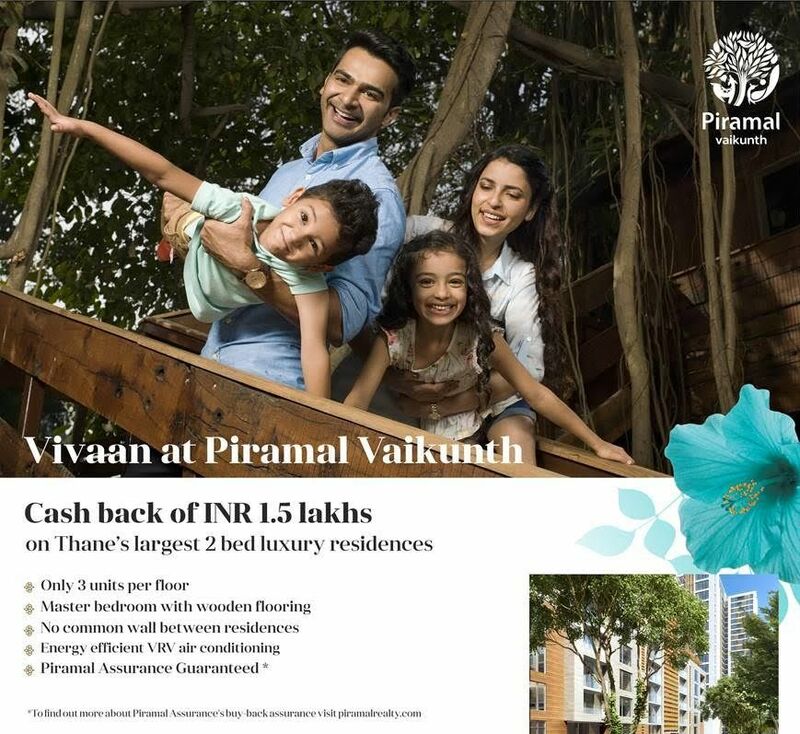 Piramal Vaikunth has pioneered a ‘founder customer’ program which has a prime focus of taking the potential customers views before building the home. Thus it has come to know what matters most to them and got help in knowing about the property aspects. Piramal Vaikunth gave priority to light, spaciousness and ventilation along with natural greenery which are the core principles of biophilic design. Another important aspect of the design philosophy was living in a community of like-minded people. To improve residents’ quality of life Piramal Vaikunth has incorporated all these elements into its designs. The homes are set in a large area with high ceilings thus enforcing the principle of spaciousness. Abundant ventilation is provided by dual aspect apartments with floor-to-ceiling windows. At the same time they also provide sunlight and spectacular panoramic views.Natural, indigenous and sustainable materials have been used to construct buildings in the estate. A great warmth to living spaces is provided by Walnut and ceruse oak floors. With the help of quartz and elegant marble dazzle is provided in the rooms. Landscaped podiums, cobbled streets and fractal-patterned walls mimic the intricate designs of salt flats and sea shells which are beautiful to look at and also Ecofriendly at the same time. 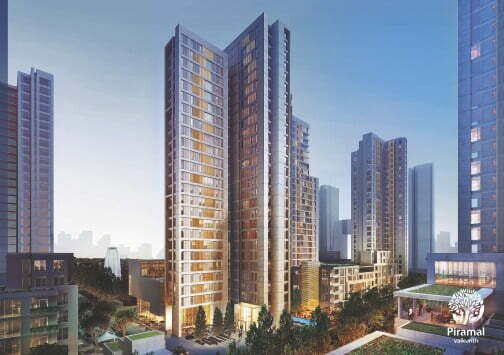 Piramal Realty has commercial, residential and mixed use developments which span across Thane and Mumbai.It is guided by landscape developments and architectural designs and believe in “Biophilic Design Philososphy”. It makes sure that residents and occupants remain in close proximity to the nature. There are more from Piramal realty which includes high rise pristine towers which overlooks the pristine 53 acre Botanical gardens in Byculla. This is easily accessible and well connected through roads and rail networks. So this is the best time for you to buy property because of great options available. 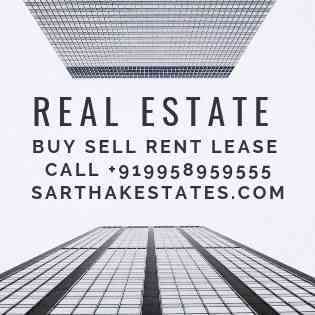 DLF Capital Greens New Delhi, Capital Greens Shivaji Marg Delhi,Dlf Capital greens resale call+919958959555.